My love language is detailed millwork. I am just consistently drawn to detailed mouldings. 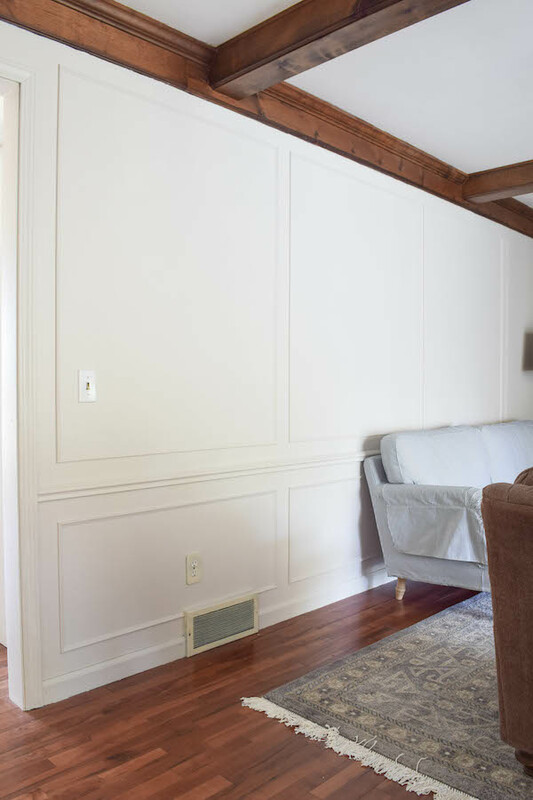 This year for my birthday, I picked a kind of indulgent project around the house to do (that we wouldn’t normally have time for) and my heart sang imagining a wall paneling in the living room. The most intimidating part of this project for me was getting the sizing and proportions of the boxes right! It was a bit of a big job to tape them off, but I had to do it to make sure we liked where we were headed. That along with some digital mock ups I made too. 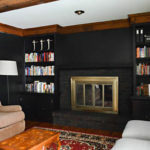 You will notice of the four boxes above the sofa, the one on the far left is smaller. After taping up, we realized that distance from the ceiling and stair rail felt a bit better than how I had taped the rest. The measurements we landed on are three inches from everything (crown, chair rail, other boxes, a wall). We are putting boxes below the chair rails too that are the same width as the box it is beneath. But I skipped bothering to tape those up too. This above boxes on the wall to the kitchen look a bit a mess because we are planning to widen that doorway and this is simulating about how big the boxes will be once that is opened up. For now, we did not put up millwork here, but I wanted to visualize to make sure the box sizing looked good with everything else. I wondered how important it is for boxes to all be the same size and from testing it out in our room and studying inspiration photos, it seems not that important. Above the couch they are 42 inches wide. The ones near the slipper chairs are 38 wide. The ones around the new kitchen opening will be a bit smaller. The one to the right of sliding door is the biggest, but that would have looked choppy to be split into two. And that vignette is really visible from the entry so making that stand alone well is important. Oh and there is one above the mantle as well. We tested two different trims for the millwork, this one and another one that was a bit chunkier. I am convinced both could have looked good, but we decided the more petite one would be better to avoid overwhelming the room. 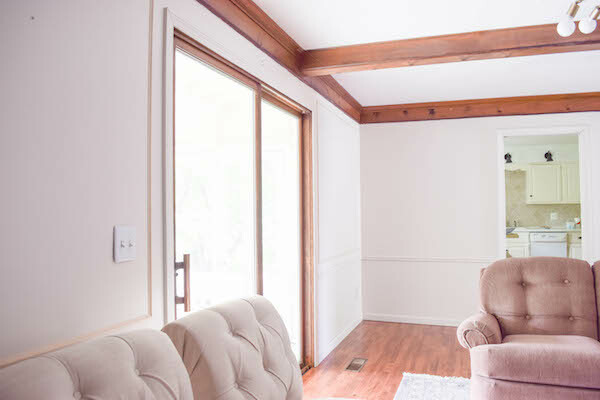 We don’t have grandiose ceilings, and this room already has big crown moldings and beams. They are sold in 8 foot pieces at $5.17 each. It was about $150 for this room. With this project we decided to spring for a new cordless nail gun and David is singing its praises. Our other nail gun is a 16-gauge that uses compressed air. It is stronger (so it was good for our wood floors) but noisier and more cumbersome. We bought this 18-gauge cordless version and it is so much quieter. And David estimates this project would have taken 30% longer using the corded gun because it is bulkier and you have to stop and start to reload air. To install each piece, we measured and leveled carefully, adding a line of liquid nails (this one) to the backside of the trim, and secured it in with a few 1 and 1/4 inch nails with the nail gun. The seams were so small we did not need to caulk. So we just speckled and painted. It took about 20 work hours for the entire project. While painting the new millwork, I went ahead and did the sliding door which we had previously left wood and 100% wish was white like the walls. 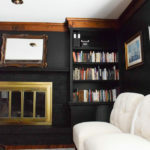 This room needs less brown any way it can get! 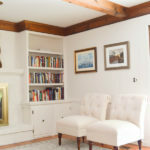 The ceiling beams and wood floors are the only browns safe from eradication. Yep, I love this addition. 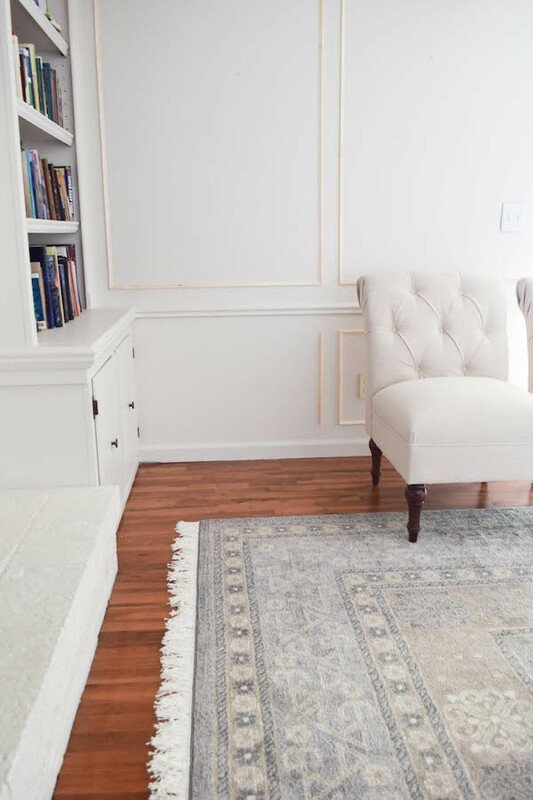 There are so many architectural details you can add to walls that I love – this, wainscoting, board and batten, shiplap. I need to do only a couple in our house for it to not feel crazytown. Shiplap in the office doesn’t count because its just an isolated part of the house that is meant to feel separate from everything else. 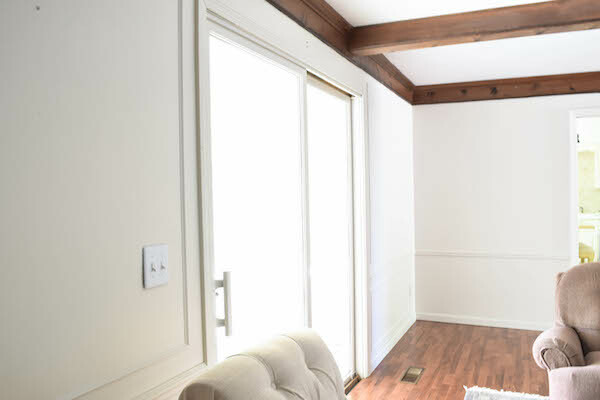 So maybe only this style millwork or board and batten anywhere else? I think I can do that. 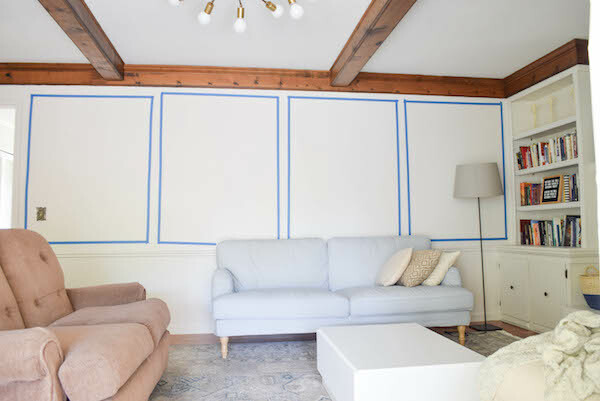 Or should I skip board and batten and only do this? To be continued. 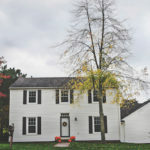 We just started our new carpentry company not too long ago and saw this great article! It’s a great read, appreciate you taking the time on sharing your project with us. 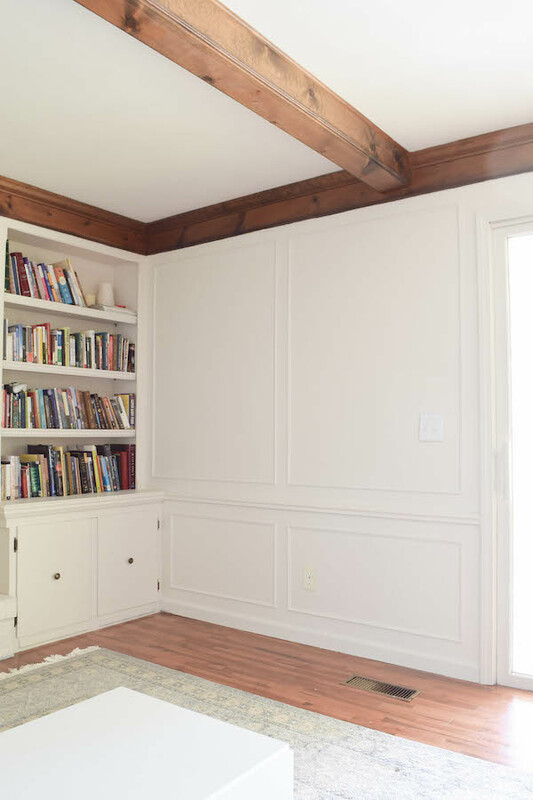 The wainscoting you made is very decorative. Thanks a lot for this blog post! This looks amazing! Any tips for the measuring/cutting part? 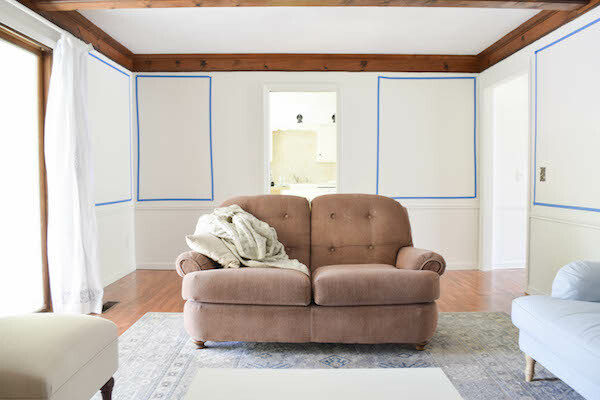 I want to do this in my house but have very little in the way of tools and worry that little mistakes will completely mess it up. From David: I used a miter saw to make the cuts for this project. Once you cut the pieces for your first box, you can use those as templates for the rest of the pieces. When in doubt, cut a piece a little longer then you can trim it down to fit. The good news is if you mess up on one piece, you can probably still re-cut it for a different section of the room.